PET ANIMAL NEW PATIENTS RECEIVE 15% OFF FIRST PHYSICAL EXAM. Sign-up using the form or call us at 740-467-2949 to take advantage of this exclusive offer. The Parvovirus is known worldwide and causes disease in many different species of animals. Different strains of virus only infect certain types of animals. For example, the Canine Parvovirus (Parvo) will mainly infect dogs and does not cause disease in cats or humans. Feline Parvovirus, a different strain of virus, causes a different type of disease known as Feline Distemper. Canine Parvovirus made its first appearance in the late 1970s and was first identified as a distinct disease in 1978. As a result of global travel and the importation of animals, the disease spread around the world in only one to two years. Most canines at the time had no natural immunity to the virus and its spread was rapid and devastating, especially for puppies. The virus is released into the environment from infected puppies when they have a bowel movement. When unprotected dogs come into contact with the feces (stool), infection occurs when the virus is ingested. All dogs are at risk, but unvaccinated puppies are particularly susceptible to infection. Most dogs with parvo have symptoms of lethargy; loss of appetite; fever; vomiting and severe, often bloody, diarrhea. Dehydration develops rapidly and can be fatal. Early detection and treatment by your veterinarian are essential to improve the chances of survival. This usually involves several days of hospitalization in the intensive care unit at your veterinarian's facility. Many factors are in play but even with the proper care, the puppy may not survive. 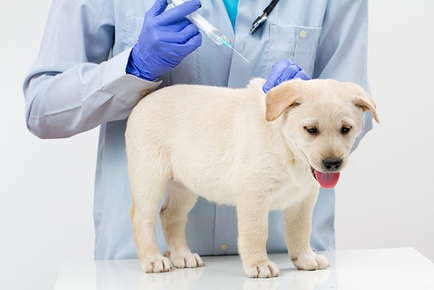 Vaccination and cleanliness are critical to preventing Parvovirus infection. Your Veterinarian will design a vaccination schedule tailored to your pets particular needs.